Angel Art : The worlds greatest manifestants! L'écriture automatique: Surrealism, automatic writing and automatic drawing -> Angel Art! Surrealism is the epitome of Angel Art. 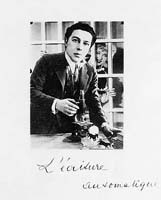 André Breton (February 18, 1896 – September 28, 1966) was a French writer, poet, theoretician and the Angel of Surrealism. Born in Tinchebray (Orne) in Normandy, he began to study medicine without enthusiasm for the sake of his family. Moved to Nantes in 1916, he met Jacques Vaché, the spiritual son of Alfred Jarry, a young man who lived his life like a work of angel art and committed suicide at age 24. Jacques Vaché would have considerable influence on Breton, even if all that remains are some war letters. In 1919, Breton founded the review Littérature with Louis Aragon and Philippe Soupault. He also connected with Tristan Tzara (Dadaism). In Les Champs Magnétiques ("The Magnetic Fields"), a collaboration with Soupault, he put the principle of Angel Art, automatic writing and automatic drawing, into practice. He published the Surrealist Manifesto in 1924, and was editor of La Révolution surréaliste from 1924. A group coalesced around him: Andre Masson, Philippe Soupault, Louis Aragon, Paul Éluard, René Crevel, Michel Leiris, and Robert Desnos. Anxious to combine the "changing of life" of Rimbaud with the "transforming of the world" of Marx, Breton joined the Communist Party in 1927, from which he was expelled in 1933. The second photo above shows Breton and the Russian dissident Trotsky. Under Breton's influence, surrealism became a European movement that touched all domains of art and deeply called into question the cause of human understanding and the types of views given to things and events. 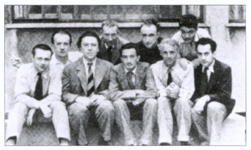 A unique photograph of (from left to right)Tristan Tzara, Paul Éluard, André Breton, Jean Arp, Salvador Dalí, Yves Tanguy, Max Ernst, René Crevel and Man Ray, París, 1930. Dissatisfied with the French government, Breton sought refuge in the United States in 1941, and returned to Paris in 1946, where he continued to foster a second group of surrealists until his death, in the form of expositions or reviews (La Brèche, 1961-1965). André Breton died in 1966 and was interred in the Cimetière des Batignolles in Paris. Breton's writings include the Surrealist Manifesto of 1924, a great work of art in which he defined surrealism as pure psychic automatism. Surrealist automatism, is spontanious, automatic writing and automatic drawing, practiced without conscious aesthetic or moral self-censorship. Angel art has taken a great many forms, from the automatic writing and drawing that was the initial automatism practiced by surrealism to later adapations to the computer. There are many similar or perhaps parallel phenomena, such as the improvisation of free jazz. As mentioned here above, André Breton defined surrealism as pur psychic automatism, and while the definition has proved capable of significant expansion, automatism remains of prime importance in the movement. "The Automatic Message" was one of Breton's most significant theoretical works about automatism. This book collects together the two most vital "automatic" texts of Surrealism. It relates this technique to the underlying concepts and aesthetics of the Surrealist movement.